TNA: Kenyan President Rejects Obama's Assertion "Gays Are People," Worthy of "Equal Human Rights"
Kenyan President Rejects Obama's Assertion "Gays Are People," Worthy of "Equal Human Rights"
KENYA (The Nil Admirari) - Earlier today, Kenyan President Uhuru Kenyatta rejected President Obama's assertion "gays are people and deserve equal human rights, not government endorsement and enforcement of intolerant religious-based laws against them." Kenyatta assured the world he was deeply honored to be Obama's host during his visit to Kenya, but claimed "Kenya does not need advice on what to do with its much-hated social deviant homosexual population." "We know how to handle the animal that is the homosexual here, especially the male variety. Kenya throws its homosexuals into prison where they will have close and constant contact with each other, which we believe will show them the error of their immoral ways, " explained Kenyatta, who sounded eerily like a GOP presidential candidate. 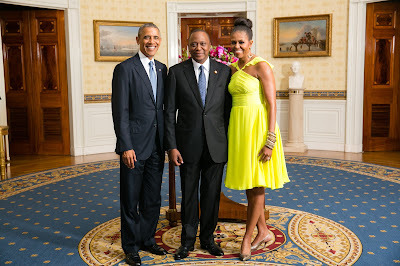 President of the Republic of Kenya, White House, Aug. 5, 2014. Kenyatta added, "Kenya is doing exactly what the Republican Party wishes it could do in America, and many of its presidential candidates have contacted me be their running mate. We are all proud of President Obama, but the Republicans know religious rights are violated when you cannot impose them on everyone else." Republican presidential candidate Donald Trump announced President Kenyatta was on his shortlist of VP candidates, because he "recognized equal rights are not for everyone, and most people don't even want them, anyway." Obama promised the issue "would definitely come up again" on his next trip to Kenya, which many Americans who suffer from a wide range of mental illnesses think is his actual place of birth.